Lowest backlash of 0-3 arcmin. High torque and high dynamic. 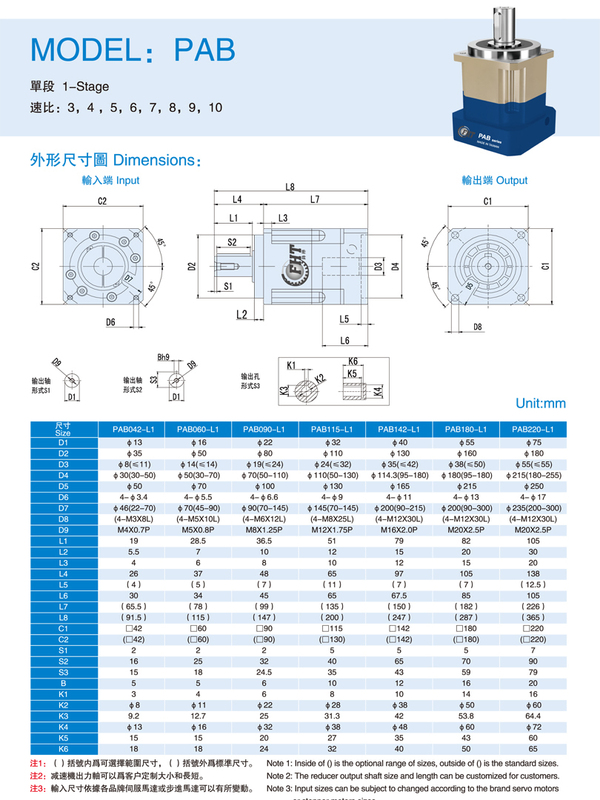 Applicable for all servo motor and stepper motor. Improve the rigidity and increase the motor rotor inertia. Miniaturization of motor power. At the same time, improve the stability of inertia load and reduce the vibration. The surface of the gear box is treated with electroless Nickel, and the connection plate is treated with blue anode to improve the tolerance and corrosion resistance of the environment. Taiqi Seiko PAB series high precision planetary gearboxes consists of a complete sizes of inline gearboxes also called Coaxial gearboxes. 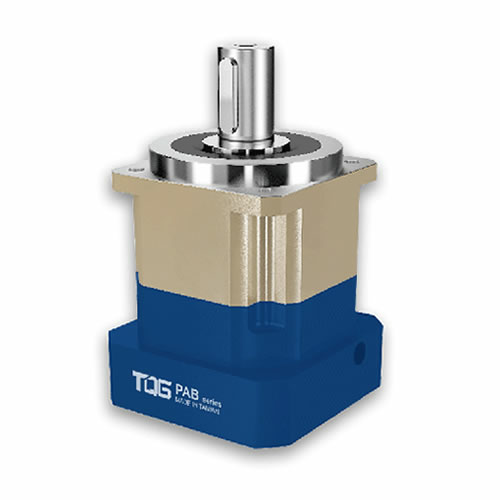 There are three optional backlash PAB planetary gearboxes for choice: Micro precision backlash (P0), precision backlash (P1) and standard backlash (P2), which are featured with outstanding performance and widely applied in motion control industries for servo application. 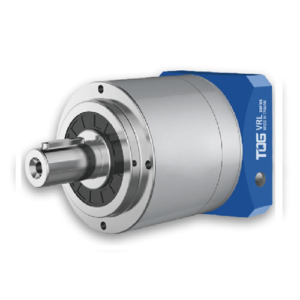 Taiqi Seiko PAB precision gearboxes are featured with high torque and the input stepper diameter D4 can be up toφ255mm, which can greatly meet the customer needs of high torque. Single-stage planetary gearboxes and two-stage gearboxes for selection according to your application needs. 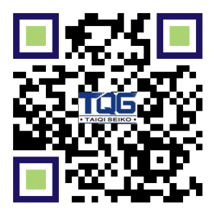 Note：Three-stage technical data are not available in Taiqi Seiko catalogue. If needed, please contact our sales person. 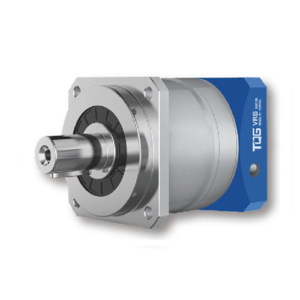 Taiqi Seiko PAB High Precision Planetary Gearboxes are extensively applied in the aviation industry, spaceflight, ship, radar, submarine, food machinery, medical machinery, women’s supplies machinery, composite materials. Equipment, precision testing instruments, data communication system, robot, mechanical arm, CNC machine tool, cutting and welding equipment, laser system, textile machinery, printing and dyeing machinery, packaging machinery, printing machinery, testing machines, stamping technology, plastic machinery, glass machinery, lifting machinery, metallurgical machinery, engineering machinery and University Scientific Research Institute and so on. 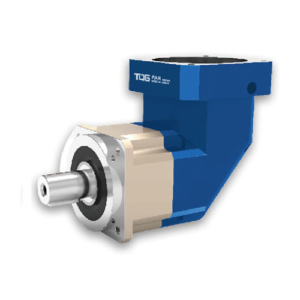 Output configurations of Taiqi PAB speed reducer are keyed solid shaft-outputmethod, Keyless Solid Shaft Outputor output for holes. It depends on the specific needs of customers. 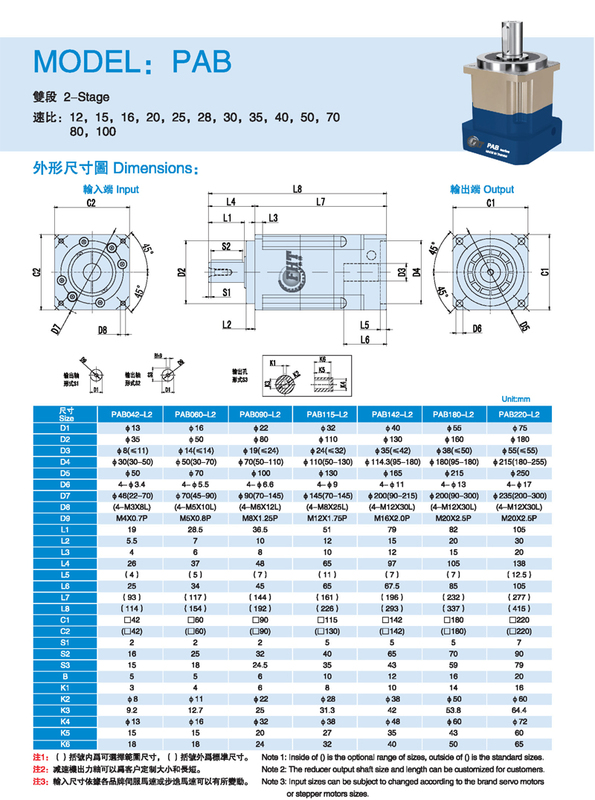 Applicable motorsare servo motorsand stepper motors for all Japanese, German, Taiwan or American brands. 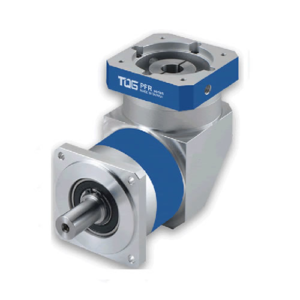 Why Choose TQG PAB Planetary Gearboxes for your precision application? Finite element analysis of gear strength is carried out by using ANSYS technology. 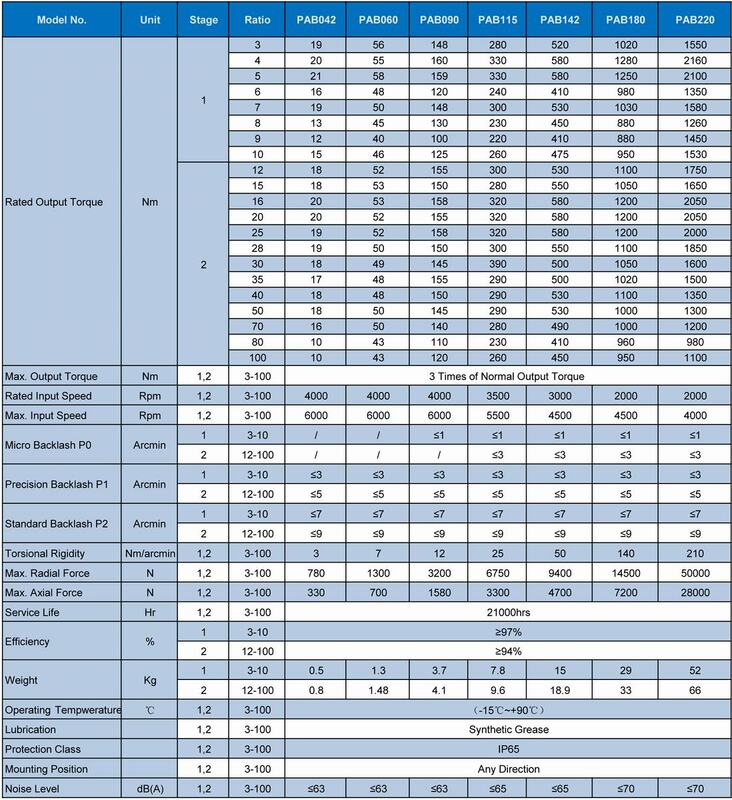 Tooth profile and lead trimming of tooth surface are also made to reduce the impact and noise of gear meshing, and increase the service life of gear system. Carbon-nitridingheat-treated high quality alloy steel is adopted in gear materials to obtain the best wear resistance and impact toughness. The output planet carrier adopts integral (double support) structure design. The large span of the front and rear bearings is distributed inside the box body, forming a stable integrated structure to ensure high torsion rigidity and accuracy. An integrated design of the tooth ring and the output shell is adopted, and high quality steel is used to get high material density by hot forging. The integrated design can ensure that all geometric dimensions are finished in one time and have higher precision and strength compared with other embedded and clamped structures. The input shaft and locking device are designed in an integrated way. The two bolts are symmetrically distributed to achieve dynamic balance. At the same time, through the strong locking of double bolts, the motor shaft transmission is effectively prevented from slipping and the high-precision zero backlash power transmission is achieved.